What's is Mee Audio P1? I'm no stranger to the MEE Audio products (formally known as MeeElectronics) but I would never have really considered them as competitors in the mid to high-end earphone space. Traditionally the company always did budget gear and they did it very well as was the case with the M6. So doing a Mee Audio Pinnacle P1 review required a bit of a change in thinking. The Mee M6 has been on our list of the best sports headphones for almost half a decade now but the Pinnacle P1 represents a major step forward, and a hike in price. Priced at $199 it is an over ear stage monitor style IEM with a metal body and sound is produced via 10mm dynamic driver. It seems interesting enough so let's get into the full review. The P1 are a set of mini tanks! During testing I found them to be both good looking and tough. It's a fairly typical over the ear monitor design but instead of building them out of plastic Mee Audio has gone ahead and made the housing out of solid metal. That makes a hell of a difference and the P1 certainly feel more premium than the companies previous in-ear headphones. The finish on the housing feels ok, it could be a bit more refined but I like the gunmetal colour and would consider them reasonably good looking earbuds. One thin I like is that the edges are all rounded and there are no sharp edges so they sit really nicely on the ears and are comfortable to wear over long periods of time. While we wouldn't call them the best-looking earphones in this class the do have something about them. For example, the RHA t20i cost just $50 more and are significantly better looking and more refined than the Mee Audio Pinnacle. The excellent Shure SE315 and the Dunu DN-2000 also come in at the same price and while I like the P1's Design I don't think the manage to best any of them. The cables are detachable. This is something we are seeing more and more of in earphones at all price ranges. It lets users change or replace the cable at a low cost without the need for buying and entirely new set if things go wrong. As the Pinnacle P1 are worn over the ear there are no microphonics at all and in day to day use we found the cable to be well behaved and resistant to tangles. Its not quite the premium feel you get on Vsonic's GR07 or as stylish as some of my custom cables but it gets the job done. Inside the P1 housing you will notice that Mee Audio has opted to go with a dynamic driver as opposed to a balanced armature setup. We will cover the sound portion later but it is an interesting choice as you more commonly find BA's or Multi BA setups at this price. Included accessories at excellent. Mee Audio have included a lot of tips in many different styles with the P1 so finding the right fit for you should be no problem. We also really like the included leather carrying case. Its high quality an adds to the overall premium feel of the package. Another high point is the inclusion of 2 cables, one with microphone and one without, which is something we would like to see more companies doing so hats off to Mee. 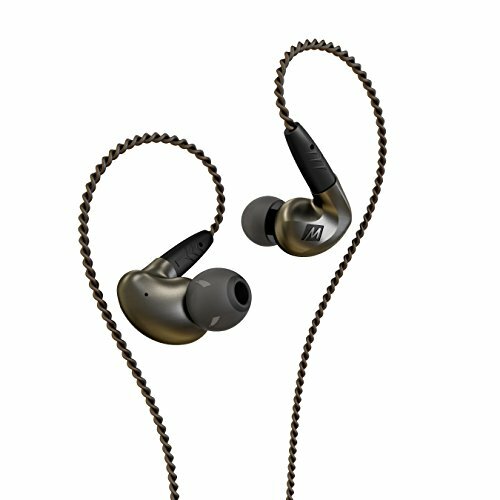 The P1 are strange beasts in that they offer a lot of the benefits you find in balanced-armature and dynamic earphones. There is a lot of detail yet the soundstage is pretty big. Imaging is great and the experience is almost out of head rather than cramped as IEM's (In ear monitors) usually sound. The are tuned in a way that a lot of audiophiles will enjoy but my guess is that the general public will be less impressed. The Pinnacle P1 sound very flat in their response with no warmth and very little bass. It lends itself to being very good for analytical listening but I couldn't quite get into it for pure enjoyment. Treble is sparkly with boatloads of detail but sometimes has the tendency to get overly hot if fed the wrong track. Personally, I prefer a smoother treble but I know a lot of K-Pop and jazz fans have been crying out for something like this. Mids are again very detailed and very accurate, they are definitely the high point of the earphone. The are super clear in the midrange and come across uncluttered and un obtruded. Zero bleed was observed from the low end into the mids and both male and female vocals were given ample room to shine and become the forefront of a performance. The low are of the crisp and punchy and while they don't extend to the darkest of depths it works well with rock, jazz, and classical music. If you are more into hip hop & R&B there will be better options out there but purists will enjoy the Pinnacle P1's ability to remain composed and accurate in relation to the other sound frequencies. Judging by the sound alone you can tell that this earphone has been designed to fit the needs of the portable audio community. It's a pure and unbiased audio experience that excels in a lot of areas when compared to other models in the sub $200 price range. The build quality is excellent and the well thought out accessory set is greatly received. A combination of transparency and soundstage will make them appealing to purists even though they might not be as well suited for those with a predisposition to coloured bassy headphones. An excellent earphone for the price an we look forward to seeing more of Mee Audios higher end products in the future.